One of the blog posts that I keep swirling around in my head for a moment when I can get around to it is entitled House Safari. The idea is that I walk around the house taking pictures of all the wild things that have asserted their right to roam on the imposition that is my dwelling place and consequently share the space with me. It's surprising just how many different organisms are prepared to make a life in the human space. 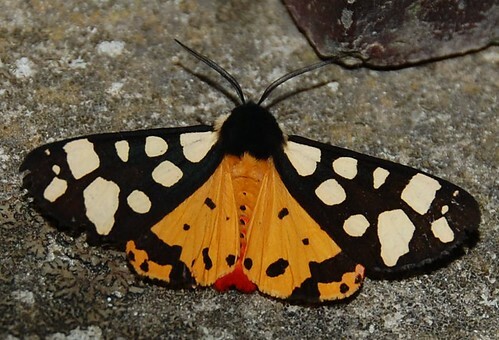 The moth wanted to come in very much but was frustrated by the window. The slug below had no such problems, and I think must have made use of the cat flap for her ingress. When I found her she was half way up the glass door looking for the exit. I was pleased to help her on her way. 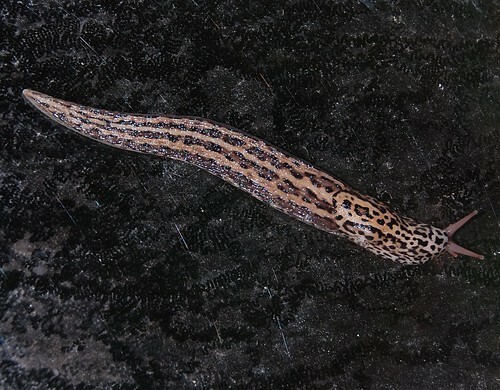 Leopard slugs (Limax maximus) are omnivores and in the house she was probably cleaning up the door glass for me looking for other slugs (yes, there are some) and fungal growths but they can and do eat young plants. Even so, they are so much more attractive than the average slug it's hard to kill them, I took her to a place of safety in the bramble patch near the wood shed, well away from my vegetables. 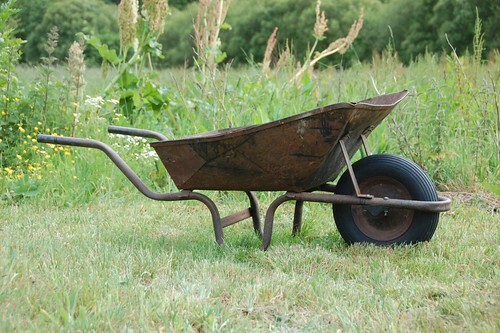 The wheel barrow is on its last legs if such a thing is possible, so I thought I'd immortalise it on blogger. We bought it in Ireland years ago and it has an irritating slow leak in the tyre that has to be pumped up before each day's use but with the sentimentality of the tool user I'll be sorry to see it go. Still no rain. The French government have published maps of the areas of drought and the measures in place to help survive them. For the moment Normandy seems to be managing on a meta-scale but here on the ground it's a very sorry story. The early start is now lost as plants stubbornly refuse to grow in the dryness. Plants I've started indoors and planted out are still the same size as when they were placed, seeds have germinated but are barely hanging on. I noticed today that the White Emergo runner beans are making an attempt to grow. Beetroot is germinating too but the parsnips aren't for the second time and the scorzonera is equally recalcitrant. The large rose radishes are up but the old black radish seed is obviously gone over which is a pity. I've planted out half a dozen of the Carter's Polish beans and four of the Giant Purple. There is a tray of Riana's climbing bean to go in tomorrow as I'm frantically trying to get everything out of pots before I go away for a week. My catsitter will water the greenhouse for me but I can't expect him to manage a thousand baby plants at the same time. 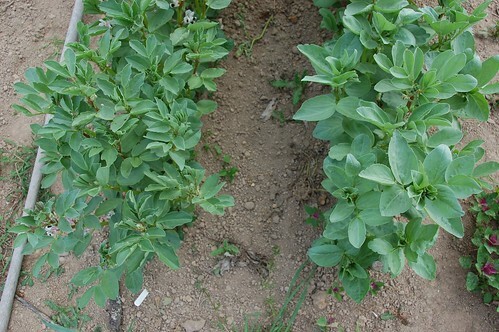 Below the two sort of broad bean. On the left is the Ful and the right are the Martock. I sniffed the flowers for their magnificent scent (if you've never tried the perfume of broad beans flowers, you simply must, it's divine!) and think that the Ful smell slightly more attractively than the Martock but it's a close thing. There may even be some baby pods to harvest on my return. Broad bean flowers have one of my favourite scents. When out and about, if I catch a whiff I wind down the car window sniffing, trying to identify where the field is. Do you eat the tops of the plants when they're pinched out against blackfly? Rhizowen, you're right, it is fascinating. I'll have to see if I can get pictures. Hello Z, I do eat the tops of the beans sometimes but rarely pinch them out against blackfly. I'm lucky here to have lots of voracious ladybirds to eat the pests up for me.